vvith the complaint of Rosamond. Sonnets. | Complaint of Rosamond. 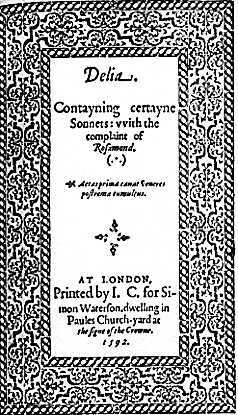 Note on the e-text: this Renascence Editions text was transcribed and edited from the Scolar Press facsimile by Thomas Larque by whose kind permission this Renascence Editions text is provided. A few emendations have been undertaken, including those offered by the errata, within square brackets. Catchwords and pagination have been omitted. Content unique to this presentation is copyright © 1998 The University of Oregon. For nonprofit and educational uses only. Send comments and corrections to the Publisher. the signe of the Crowne. Entle Reader, I pray thee correct those faultes escaped in the printing, finding them as they are noted heere following. Ight honorable, although I rather desired to keep in the private passions of my youth, from the multitude, as things vtterd to my selfe, and consecrated to silence: yet seeing I was betraide by the indiscretion of a greedie Printer, and had some of my secrets bewraide to the world, vncorrected: doubting the like of the rest, I am forced to publish that which I neuer ment. But this wrong was not onely done to mee, but to him whose vnmatchable lines have indured the like misfortune; Ignorance sparing not to commit sacriledge vpon so holy Reliques. Yet Astrophel, flying with the wings of his own fame, a higher pitch then the gross-sighted can discerne, hath registred his owne name in the Annals of eternitie, and cannot be disgraced, howsoever disguised. And for my selfe, seeing I am thrust out into the worlde, and that my vnboldned Muse, is forced to appeare so rawly in publique; I desire onely to bee graced by the countenance of your protection: whome the fortune of our time hath made the happie and iudiciall Patronesse of the Muses, (a glory hereditary to your house) to preserve them from those hidious Beastes, Obliuion, and Barbarisme. VVherbey you doe not onely possesse the honour of the present, but also do bind posterity to an euer gratefull memorie of your vertues, wherein you must survive your selfe. And if my lines heereafter better laboured, shall purchase grace in the world, they must remaine the monuments of your honourable fauour, and recorde the zealous duetie of mee, who am vowed to your honour in all obseruancy for euer. Witnes your Fathers griefe exceedes all other. May iustly praise, and blame my loueles Faire. Waken her sleeping pittie with your crying. And tell th'vnkind, how deerely I haue lou'd her. Let them yet sigh their owne, and mone my wrongs. Whilst blinded ones mine errours neuer gesse. You best can judge the wrong that she hath dunne. Who whilst I loue, doth kill me with disdaine. Forging a greife to winne a fames rewarde. Best in my face, how cares hath til'd deepe forrowes. Of her milde pittie and relenting will. My loue affects no fame, nor steemes of art. Diana-like, to worke my suddaine change. Castes water-cold disdaine vpon my face. My thoughts like houndes, pursue me to my death. Are made by her to murther thus their Lord. Sacred on earth, design'd a Saint aboue. And Clowdes obscure had shaded still her brightnes. Nor yet the world had heard of such disdaine. Did force me grone out griefes, and vtter this. My sence opres'd, had fail'd; and hart had broken. Still to complaine my griefes, and none releiue me. O then love I, and drawe this weary breath. The truest loue that ever yet was seene. Prayers preuaile not with a quaint disdaine. No fauour though the cruell faire allowes. Flint, Frost, Disdaine, weares, melts, and yeelds we see. Which cleere our clouded world with brightest flame. I weygh no comfort vnlesse she releeue mee. Whose rowling grace deigne once a turn of blis. So much I loue the most vnlouing one. I worke on Flint, and that's the cause I mone. Hard is her hart and woe is me therefore. Vnhappy I to loue a stony harte. And she th'vnkindest maide still scornes the same. Pleas'd in my hurt, inur'd to liue forlorne. That now at length t'yeelde, meere pittie were it. Finding no ende nor Period of my payning. And th[u]s I liue, because I loue her deerely. And to th'Orient do thy Pearles remoue. Vexing with vntun'd moane, her daintie eares. To vse me thus and knowe I lou'd so long. Whilst my best blood my younge desi[er]s sealeth. Yet neuer mercy to my merit giueth. So high attempts to lowe disgraces fall. Vnto the tyrant; whose vn[k]indnes kils. And winter woes, for spring of youth vnfit. Yet must that blisse my hungry thoughts appease. Once let her loue indeede, or eye me neuer. Yet neuer any true effect I proue. As one that dyes without her company. And so sent backe and thus my fortune lyes. Hopes are vnsure, when certaine is my paine. Whose clouded brow dooth make my daies so sad. That thus I liue booth day and night annoyde. Ile praise her face, and blame her flintie hart. Her for disdaine, and me for louing thus. Hoping thereby to free my better part. An other passage opens at her voice. With three such powers to plague one silly harte. Reigne in my thoughts, my loue and life are thine. They all erect their Trophies on my fall. And yeelde me nought that giues them their renowne. And serue all three, and yet they spoile me too. Where it presum'd his safetie to be neerest. And yet no comfort would her brow reueale mee. With still fresh cares my present woes assayling. And giue the cruell Faire her tytle dew. Her pride brook'd not poore soules shold come so nye her. I onely sought the blisse to haue her sight. [ ] Fram'd my desires fit for her eyes to kill. Whose state best shewes the force of murthering eyes. Vppon my selfe you best may finde the forme. Narcissus chaung'd t'a flowre in such a case. I feare your eye hath turn'd your hart to flint. Shall faile in force, their working not so stronge. Then fade those flowres which deckt her pride so long. For what she was she best shall finde in you. But Phenix-like shall make her liue anew. That pure sweete beautie, Time bestowes vppon her. So clowdes thy beautie, after fayrest shining. Dissolues the beautie of the fairest brow. But loue whilst that thou maist be lou'd againe. Now vse thy Summer smiles ere winter lowres. And Delia, thinke thy morning must haue night. Which then shall hide it most, and couer lowest. When once they finde her flowre, her glory passe. That tells thee trueth, and saies that all is gone. My faith shall waxe, when thou art in thy wayning. And that thou wast vnkinde thou maiest repent. When Winter snowes vppon thy golden heares. Suffice, thou shalt be lou'd as well as shee. Shall rest in y[c]e, when thine is grau'd in Marble. Yet count it no disgrace that I haue lou'd thee. [W]ithin themselues; and on them ploughes haue eared. Th'eternall An[n]alls of a happie pen. Which shall instarre the needle and the trayle. Dooth her vnto eternitie assommon. Now send foorth hopes, for now calme pitte saues. To saue thine owne, stretch out the fayrest hand. For that which gaue me woundes, Ile giue it kisses. That thou be pleas'd, and I may sigh no more. Wrought by her hand, that I haue honoured so. Of her owne seate, whereof I made her guide. Because their powre serue to exact the same. The Temple, where her name was honored still. For to their flowe she neuer graunts an ending. Then mine to her in truth haue euer beene. Then I would ioy the fayrest she that liueth. As now I taste in compas of complayning. From out despayre wherein they liue confin'd. To breake the yce that hath congeald her hart. Whether my faith hath not deseru'd her loue. Yet deignes not with one simple signe t'expresse it. And straight tis gone as it had neuer beene. Yet which at length thou must be forc'd to lose. Dated in age the Kalends of our death. And women grieue to thinke they must be old. And she is young and now must sport the while. Let loue and youth conduct thy pleasures thither. Pittie and smyles shall yeeld thee lasting prayse. Happy the hart that sigh'd for such a one. Th'eternall volume vvhich her fame compyleth. Without the torment of the nights vntruth. To adde more griefe to aggrauat my sorrow. And neuer vvake, to feele the dayes disdayne. Whose beautie made him speake that els was dombe. Against the Darke and times consuming rage. Suffice they shew I liu'd and was thy louer. On my hart strings high tun'd vnto her fame. Whose due reports giue honor to her eyes. Then iudge the world her beautie giues the same. And blessed hand that giues so sweete a tuch. Which meaner priz'd and momentarie bee. Basely attending on the hopes of men. Shall have my song, where Delia hath her seate. Ile sound her name the Ryuer all along. Inkindled by her eyes celestiall fiers. The sacrifice I offer to her sight. To my' infant stile the cradle, and the graue. Each byrd sings t'herselfe, and so will I. That shewes the world how much my griefe imported. From out this hell, which mine afflictions proue. My carres long liu'de, and will not dye without mee. I say no more, I feare I saide too much. Hath her bosome deckt with flowers. Wants refresh of better happe. Whilst that she her Louer kills. And well he' ends for loue who dies. For Fame finds neuer tombe t'inclose it in. Caron denies me waftage with the rest. Till Louers sighes on earth shall it deliuer. Procure this sacrifice amongst the liuing? Sorrow for me is dead for aye reuiuing. And that disgrac'd, for time hath wrong'd the same. That she is pass'd, and I am left behinde. To forme my case, and register my wrong. So moue thy minde a wofull womans case. To ioy the liuing and to blesse the dead. Giue comfort to thy Muse to doe her best. That thereby thou maist ioy, and I might rest. And telling hers, might hap forget mine owne. And ere they come, to know them tis forbidden. As note the sequel, and Ile tell thee how. That so great hap might make me more accurst. Deeming such beauty was vnfit for feeldes. I grounded me, and cast away my selfe. Soone could I teach my browe to tyrannize. And make the world do homage to mine eyes. The enuy of my sexe, and wonder vnto men. T'amaze the world, that holds such sights so deere. To rauish sence, and play a world in loue. What might I then not doe whose powre was such? What cannot vvomen doe that know theyr powre? How blisse or bale lyes in theyr laugh or lowre? Which cheeres the worlde, ioyes each sight, sweetens th'ayre. Thus with defect to couer our defect. The stampe of heauen, impresed by the hiest. And all that honors thee idolatrise. In all the conflicts that mine eyes begunne. That it hath powre to counter-maund all duetie. The fielde of honour, vertue neuer loses. For all are men, and all have suckt their Mothers. Vnto his feeble age did chaunce allot. For equall age doth equall like desires. Not trusting what they see, but what is told. The state of flesh, and what our frailties are. And now of loues, and pleasures must deuise. And seekes all meanes to vndermine my youth. Th'vngathred Rose, defended with the thornes. One who the liu'ry of like weakenes had. As by her words the chaster sort may conster. Both were enough to circumuent the wise. That there's no trust in youth, nor hope in age. That points thee out, and seemes thee to importune. [ ] What is the fortune that dooth followe thee. Which florish now and fade ere many howers. I would redeeme the time I spent in vayne. Is but an Eccho, and an idle voyce. In th'imaginary lists of reputation? To leaue the sweete for Castles in the ayre. And many haue it, yet vnworthy knowne. Whereof the wisest haue esteemed least. Tis warie walking that doth safliest goe. Babes are beguild with sweetes, and men with showes. Let her haue shame that cannot closely act. For what we seeme each sees, none knowes our harte. And makes the scarelet sinne as white as snow. And being sacred, sanctifies the sin. For age is prone to credite what it likes. To ouerthrow a poore vnskilful mayde. Leauing the sacred hold it glory'd in. Against my selfe, and shame did force me say. Leauing thy blush the collours of thy shame. Gracelesse to lay thy glorie in the dust. That Cliffords race should scorne thee one of theyrs. Which vs'd amisse, may serue to damne thy soule. We see the fayre condemn'd, that neuer gamed. If not, I liue disgrac'd, yet thought the same. VVherein thy shame doth compasse thee about? Thy simple yeeres cannot resolue this doubt. But in despight some scandall will be giuen. That though I sinn'd, my sinne had honest cause. Lost me the gole, the glory, and the day. For sweetly it fits the fayre to wantonise. Where he loues long desired-work should end. Which (ah too well men know) doe women moue. The mistery whereof I prying sought. Amymone how she with Neptune stroue. Beating the ayre with cryes and pittious mone. Tis shame that men should vse poore maydens so. Did seeme against the sunne cristall and perle. But crueltie, that yeeldes vnto no prayer. Alwaies in danger of her hatefull spyes. But fate is not preuented though fore-knowne. VVho worke our fall, yet make the fault still ours. VVritten in clowdes of our concealed dome? That men must know they haue the heauens aboue the[m]. But yet we choose the worst, and soone repent vs. The sweet-stolne sports, of ioyfull meeting Louers. Which yeeldes no mutuall pleasure when tis hired. What tis to[ ]come vnto a loathed bed. My nakednes had prou'd my sences liers. For first we taste the fruite, then see our sin. Shame leaues vs by degrees, not at first winning. But vse of sinne doth make it seeme as nothing. Fearing to loose the ioy of all his weale. How he might safeliest keepe so rich a pray. Able to finde no way, nor in, nor out. With sweetest flowers that eu'r adorn'd the ground. Fuell of loue, from whence lusts flames arise. None but the King might come into the place. And he himselfe came guided by a threed. Happie were Louers if they neuer knewe thee. O would to God that loue could be without thee. Which though I paide could not redeeme the same. Then to inforce the fayre to liue retired? Or what is't to be seene vnlesse admired? And though admyred, vnlesse in loue desired? 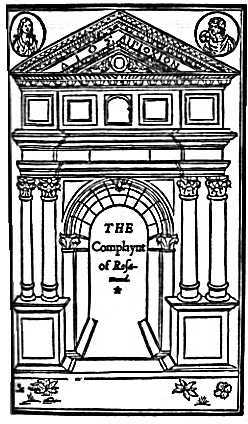 Ordayn'd to liue imprisond in a Chamber. And she that is debarr'd it, hath not right. For Beautie will be where is most resorting. That thither couets not to make repaire. Excepting Delia, left to adorne the West. To liue where we are prais'd and most desired. VVe loue to be belou'd, yet scorne the Louer. But liu'd at home a happy Country mayde. She loues sincerely, and is loued euer. True life that knowes not what's to die till death. Which bought theyr pleasures at so hie a rate. How most it hurts that most delights the sence. Forth breakes reproch when we least thinke thereon. That nothing can be doone but Fame reports. Nor stop her mouth from vtt'ring secrete things. With such reuenge as she desired long. Where she surpriz'd me whom she so abhord. Offring me most vnwomanly disgrace. As could Disdaine and Iealousie deuise. And free her feares, and ease her iealous thought. For no beast fearcer than a iealous woman. Must now receiue destruction in there-at. So short is pleasure, glory lasts not long. When I least thought my ioyes could end so soone. As he repaird to see his deerest ioy. To see his loue, and seeing beene vnseene. The sweet of life, that penetrates so neare. The deepe impression of so strange a sight? Tongue, pen, nor art, can neuer shew a right. For light cares speake, when mightie griefes are dombe. Vauporing out sighes that to the skyes ascended. Which serue for speech when sorrow wanteth words. The hatefull rayes of this vnhappy sonne? VVith blood of mine owne shame thus vildly donne? How can my sight endure to looke thereon? That from myne eyes my hart cannot abide? What saw my life, wherein my soule might ioy? What had my dayes, whom troubles still afflicted? This sweete, whose losse hath all distresse afflicted. Vext still at home with broyles, abroade in strife. Such life hath tyrants, and thys lyfe I led. VVhich wisemen see, the vulgar little knowes. On sencelesse lips, millions of kysses spends. Thys sorrowing farewell of a dying kisse. Entomb'd in your sweet circles sleepe for euer. That death it selfe, doubts whether she be dead. Hastens her speedy course to ouer-take thee. For ah what can he doe that cannot die? How faire thou wert aboue all women kind. Rose of the world that sweetned so the same. And yet respect scarce bridles such a Louer. For loue and Maiestie dwell ill together. And richly tomb'd in honorable wise. Marble and Brasse so little lasting be. Lye like confused heapes as vnder-ground. The wiser ages doe account as folly. Fevve in this age had knowne my beauties praise. Till other ages shall neglect thy rime. All Musique silent, and the Muses dombe. And Thames had Swannes as well as ever Po. And will her note the frailtie of our blood. Then she must haue her praise, thy pen her thanks. My youth such errors must no more disclose. Who made me knowne, must make me liue vnseene. Edited by Thomas Larque, January 1998. Converted to HTML by Thomas Larque and Risa S. Bear, January 1998.